Concrete pavers have come a long way in the landscape industry, today we see so many choices in color and textures. Color is a powerful decorating tool. Pavers can soften and give a warmth to outdoor living area. We always consider the amount sun or shade in a design. Will the area look larger or smaller ? With the right combination of pavers tumbled or not any landscape can become a thing of dreams. The use of concrete pavers in both residential and commercial projects is definitely increasing. In fact, its use is rapidly growing. Aside from European countries, where the use of pavers is popular, Vermont and other US states is also taking the lead. Most homeowners prefer to use paver’s particularly concrete pavers because of its numerous benefits. Pavers are often marketed as the more durable and elegant material for the hardscape compared to concrete slabs, gravel, and other cheaper alternatives. Concrete pavers are laid down like puzzle pieces. Thus, they are sometimes referred to as interlocking pavers. But, these pavers are unlike the natural stones, bricks or flagstones because they are made out of concrete. Yes, the same grey and dull concrete is used to make colorful and interesting pavers. Since they are made out of concrete, these pavers are cheaper compared to the stones that have to be quarried from other parts of the country. Quarrying will never be necessary just to bring the elegance of flagstones to your home because concrete can be shaped into any stone of your choice. Concrete pavers can also be colored and textured to your desire. Imagine the design possibility- it’s endless. Finally, your driveways, walkways, patios, and other areas in your home or landscape can be covered with your preferred interlocking concrete paver’s designs. 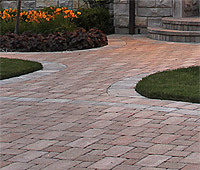 Besides the design, interlocking pavers are strong enough to resist cracking even when driven over by heavy vehicles. Their durability is partly due to their adjustable thickness and partly due to the spaces between them, which moves when necessary. These spaces also permit easy repair and replacement when one piece got broken, thus making maintenance easier than the concrete slab. Concrete pavers are obviously one of the best pavers in the market today. However, installation of interlocking concrete pavers should only be handled by professionals. You can trust our company for this project. Rainbow Acres Landscaping is extensively experienced about concrete paver’s application. We have been using this material to complete home and landscape projects in Waterbury, Montpelier, Northfield, and many other Vermont cities. So far, all of our clients who used this material have no complaint or anything. It takes a very long time before the colors fade. So expect to enjoy them for up to about 10 years. But since we want you to enjoy the color for as long as possible, we recommend using concrete pavers in areas with enough shades like the walkways, patios, and sidewalks. We also recommend using of light, neutral colors to prevent obvious fading on sunny areas like driveways, playgrounds, and pool decks. Installing pavers, even the popular paving stones, is a lot of work. It can be very messy and frustrating when you let an inexperienced contractor do the job. Repairing the damage will be very costly. Let us help you with this. Our portfolio features our past projects and some of them highlights the use of interlocking pavers. Please check it. Better yet, give us a call and let’s talk about the benefits of concrete pavers to your residential or commercial space.